Thank you for taking the time to visit the official Erickson Mfg. Co., Inc./Eagle Ditcher website. We appreciate your interest in our products and are committed to helping you make the right choice in ditchers and hitches. You can count on us not only to provide you with quality products, but to help you with your finance and lease options and with the continued service and parts support that is needed. Please contact us for more information and for a dealer near you. Edwin Erickson Sr. says the idea for his invention of the Eagle Ditcher came to him in a dream one night. The Ericksons' farm yard and fields flooded during the 1997 spring thaw. Their basement filled with water, and Ed Sr. and his wife, Marlys, spent the summer living in their camper. After the flood waters subsided, standing water filled the low spots in the fields. Even though the fields had been drained years earlier, over time the ditches had filled with dirt and needed to be cleaned out. Edwin looked at a few ditchers but didn't like what he saw. He struggled with several ideas, but none seemed to be the answer. It was then that Edwin was sleeping one night and the idea for a more efficient ditching and terracing machine came to him in a dream. Unlike other implements of its kind, Erickson's innovative Eagle Ditcher doesn't leave side ridges so water can drain freely. It was in 1999 that Erickson Mfg. Co., Inc. was formed by Edwin and Marlys Erickson. Edwin and Marlys Erickson met as teen-agers and were married in 1962. They have 4 children: Edwin Erickson Jr., Milnor, ND, Brenda Swancey, West Fargo, ND, Terry Erickson, Milnor, ND, and Theresa Erickson, Milnor, ND. Ed Jr. and Terry farm and help out with the Eagle Ditcher modifications. Brenda works in Fargo, and Theresa works for Erickson Mfg. Co., Inc. handling all the bookkeeping. Edwin & Marlys also have 10 grandchildren. Edwin says he thought about the machine for awhile. He and Ed Jr. made a miniature model of the ditcher and hooked it behind a toy tractor. To run the spinner, they hooked up an electric hand held drill. It was in the winter of 1998, Edwin Sr., Ed Jr., and Terry began working on the full sized Eagle Ditcher prototype. When it was finished, they pulled it to southern Kansas (where the ground wasn't frozen) for its first field test. "To tell you the truth, it didn't work worth a darn!" Ed Sr. confesses. They pulled the ditcher back to Milnor for modifications, then back to Kansas for more testing. It worked better, but not the way they wanted it to work. A feeding device was then added to the front and that was when the Eagle Ditcher was "born". In the fall of 1999, Ericksons' took their ditcher to the Big Iron Farm Show in West Fargo and sold nine units. 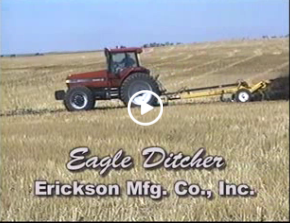 The Eagle Ditcher invention won first place in the agriculture category of the South Dakota Inventor's Congresss, held August 31st and September 1st of 1999 at the South Dakota State Fair in Huron. Eagle Ditchers were first built for the customer on Edwin Sr's farm in his shop by Ed Sr. and Ed Jr. The demand for the machine got to be too much for just two people to work on them, so the Eagle Ditcher is now being built at Barth Welding and Mfg. in Dwight, ND. Contact Erickson Mfg. Co., Inc.
"I like not having to level out dirt piles that I had when I used a scraper. I also can ditch in wetter soil than with a scraper. The Eagle Ditcher works well in many different soil types and moisture variations." Copyright © 2013-2014 Erickson Mfg. Co., Inc. & it's licensors.